Record number – select this if you want to fill in the corresponding record number as the value of each record. Constant – records of the field are set to this constant value. Sequence from constant – this option works as the consequential counter starting from the specified constant value. The constant value is put into the first record of the range. Then the value is increased and put to the next record and so on. Specify the starting value in the box below. By default DBF Viewer 2000 processes all of the records in the DBF file. 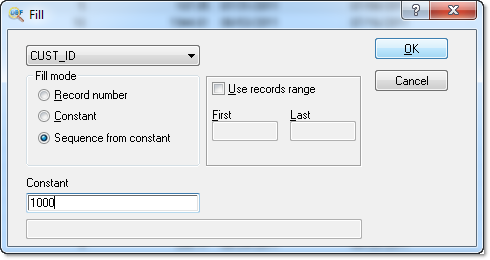 If necessary, you can limit the range of records using the "Use records range" option. Enable the option and specify the first and last numbers of records. DBF Viewer 2000 will process only the specified record interval.